Dear reader we have learnt about diffusion through concrete. We are primarily interested on oxygen and carbon dioxide diffusion. We have already learnt diffusion mechanism. Any type of movement of fluids either in gaseous or liquid state, there must have pore system in concrete and depending on their internal connection system, the movement of fluid is varied. We know intrusion of oxygen accelerates deterioration of metal reinforcement embedded within concrete and our aim is to reduce diffusion as small as possible. A term diffusion coefficient has already been introduced in our last post. Pore system of concrete is noticed to change with time and which more prominent during hydration of cement paste. As diffusion is a function of interconnected pore system, diffusion co-efficient is also changed with time. It is also noticed that diffusion through water filled space is significantly slower than that in air-filled space. 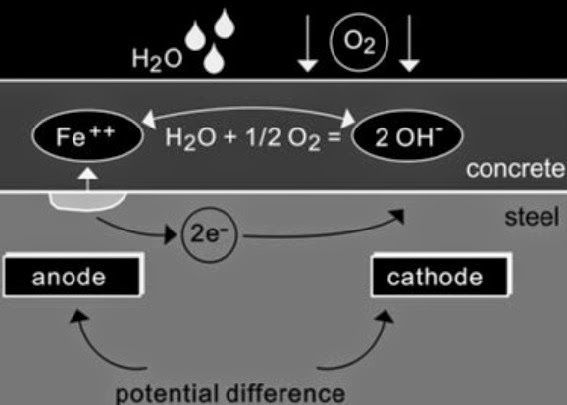 In case of oxygen diffusion, it is obvious that moist curing significantly affect diffusion of oxygen through concrete. Diffusion coefficient of concrete is observed to reduce to great extent (up to a factor around 6) under prolong moist curing. Moisture condition in the concrete has also significant influence on diffusion as water in pore also reduce diffusion rate. So a well cured concrete having less pores, pores with discontinuous system or water in pores, as a whole a good quality concrete have less susceptibility to diffusion. In our next post we will learn about effect of humidity on diffusion of fluid through concrete. How do Fluid Ingress in to Concrete by Diffusion?